Downsizing portrays a solution to over-population. Norwegian scientists, headed by Dr. Jorgen Asbjornsen (Rolf Lassgard) discover how to shrink humans to five inches tall, the theory being that tiny people will consume a fraction of the resources and take up a fraction of the space. A global transition to miniaturisation is then proposed, due to last approximately 200 years. Directed by Alexander Payne and written by Payne and Jim Taylor, Downsizing imagines what might happen when, specifically in America, people realise how much further money will go in a miniaturised world and how, on mere middle-incomes, they will be able to live like millionaires. Within a short span of 15 years or so, the process has started to become established and various high-end communities for ‘smalls’ have been created. The chief attraction however, is not a concern for the environment, but the lure of comfort and wealth. Everyman Paul Safranek (Matt Damon) and wife Audrey (Kristen Wiig) decide to abandon their stressed, hand-to-mouth lives in Omaha, where Paul works as an occupational therapist at a meat packing factory, and still lives in the house where he was born. The benefits for Paul and Audrey are clear - their assets of $152,000 convert to $12m in the miniaturised community of Leisureland Estates, which means that they could afford to retire and live in a mansion. The miniaturisation process has been refined to conveyor belt efficiency and is done entirely under sedation - the participants go to sleep full-sized and wake up tiny - the nurses lifting the clients from their beds with small, steel spatulas. However, an unexpected development regarding Audrey leaves Paul miniaturised (the process is irreversible) but also rejected and isolated. 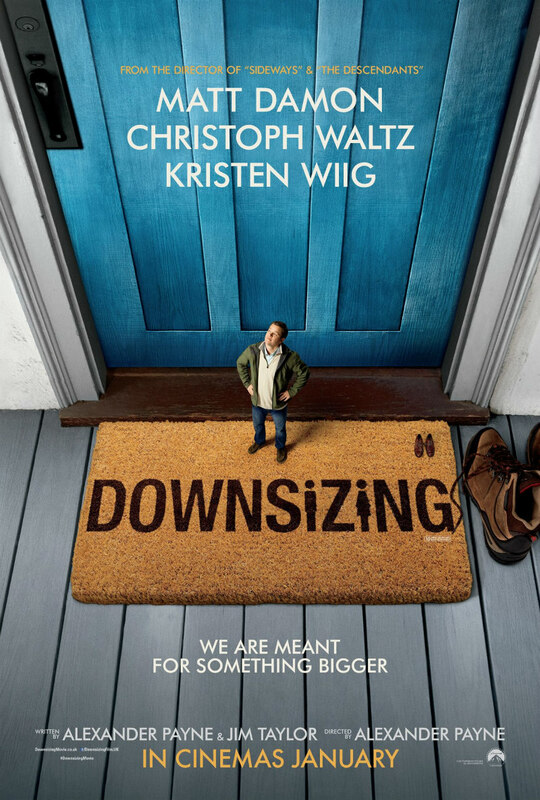 Then Downsizing takes a turn from droll, quirky comedy into disappointment, loneliness and midlife crisis, as Paul is unexpectedly deprived of the life that he had planned. Instead he is forced to ‘downsize’ in the material sense, and again earn his living. It turns out that the process of miniaturisation is being abused, with dictators forcibly shrinking rival ethnic groups and political dissidents being sentenced to shrinkage as punishment. US Homeland Security is also worried about pocket-sized terrorists infiltrating its borders in shipments of small boxes. Having moved from his mansion to a Leisureland bachelor flat, Paul learns that Dusan (Christoph Waltz), his noisy upstairs neighbour, makes a good living by importing full-sized contraband into miniaturised estates. Dusan gleefully declares to Paul after yet another all-night party, “It’s the wild west, baby!”. An army of ethnically diverse cleaning ladies comes to clear up the mess after each of Dusan’s wild parties. Among them is Ngoc Lan (the excellent Hong Chau). Ngoc Lan is a Vietnamese illegal immigrant who was shrunk against her will while imprisoned as a dissident. She is the only survivor of a gruelling stowaway entry into the U.S. (inside a TV box), severely injuring her leg in the process, resulting in a necessary amputation. Initially Paul notices and is concerned about Ngoc Lan’s ill-fitting prosthetic leg. Latching onto his medical training, she badgers him into extending his aid to Leisureland’s lowest-class citizens, who he now discovers, are dirt-poor and living outside its walls in a few leaking, dilapidated trailers converted into dingy, disintegrating high-rises for ‘smalls’. The suggestion, of course, is that Leisureland is America in microcosm. It is no ‘Nirvana’ - beneath its glossy exterior, it contains the same inequality, exploitation, corruption, prejudice, poverty and privilege. Ngoc Lan speaks in the commonplace movie-Asian method of broken, staccato English, but this is because for her there is little time for pleasantries - blunt communication regarding necessities is more useful. The character could easily have degenerated into stereotypical cliches, but in Ngoc Lan, inured to suffering, Chau creates a nuanced, warm and ultimately endearing figure, who provides many of the film’s moments of genuine emotional connection. Damon's Paul Safranek is an Everyman character who unwittingly embarks upon an extraordinary journey, reminiscent of a protagonist in a Preston Sturges or Frank Capra film during Hollywood’s ‘Golden Age’ of social commentaries, couched within the witty scripts of screwball comedies. This isn't new territory for Payne. In previous films The Descendants, Sideways and Nebraska, he examined subjects such as the crisis in American masculinity, highlighting men who struggle with powerlessness or inconsequentiality - who squirm because they feel ‘small’. In Downsizing, Payne simply turns that notion into a reality. Downsizing boasts many familiar faces in cameo roles, including Jason Sudeikis, Margo Martindale, Don Lake and James Van Der Beek. Neil Patrick Harris and Laura Dern play smarmy salespeople for Leisureland Estates, in a scene which mocks and mimics a tacky TV infomercial. Stefania Cella's production design and Phedon Papamichael's cinematography are impressive. James E. Price's visual effects are seamless, while Rolfe Kent's score supports the fantastical and grim subject matter. 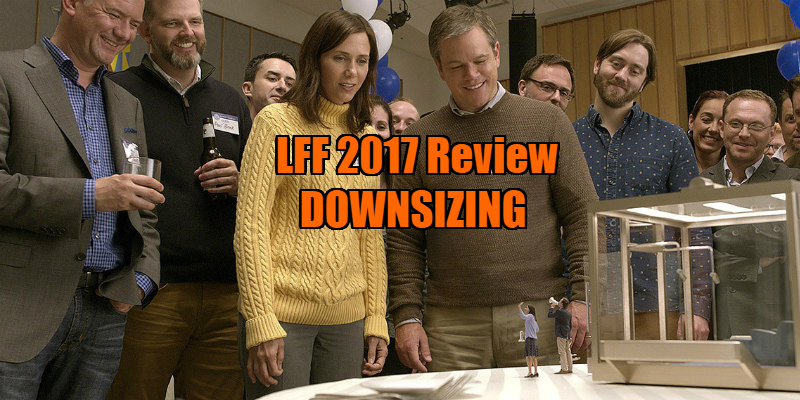 Downsizing offers broadly accessible, self-aware, if sometimes cheesy humour, with characters that remain unapologetically likeable (a brave decision to present them so affectionately in our cynical social climate). The film exudes a sense of enjoyment but has a structure that often veers dangerously from amusing to tragic themes. At least one can say that this makes it difficult to anticipate where it might be heading. Despite its uneven tone and lengthy running time, Downsizing remains an engaging, analytical and humane film - one to contemplate in harsh times. I did not expect to be quite so captivated by the tiny world it created and explored. Downsizing is in UK/ROI cinemas January 24th 2018.